Eight Weill Cornell Medicine faculty members have been selected for the fifth round of the Daedalus Fund for Innovation awards, a pioneering institutional program that helps advance promising applied and translational research projects and emerging technologies that have commercial potential. Awardees are chosen twice annually and are eligible for two levels of funding: $100,000 and $300,000 (the latter, subject to the satisfaction of certain specified pre-defined milestones). The researchers — Drs. Julie Blander, Lew Cantley, Juan Cubillos-Ruiz, Peter Goldstein, Matthew Greenblatt, Barbara Hempstead, Steven Lipkin and Shahin Rafii — have each won a Daedalus award to fund proof-of-concept studies that will enhance the data package, thereby helping to upgrade their technologies and translate their early-stage discoveries into new therapeutic modalities and hopefully more effective treatments for patients. The fund’s independent external Scientific Advisory Committee, comprised of seasoned technology analysts from the biopharmaceutical and venture capital industries, selected the projects. 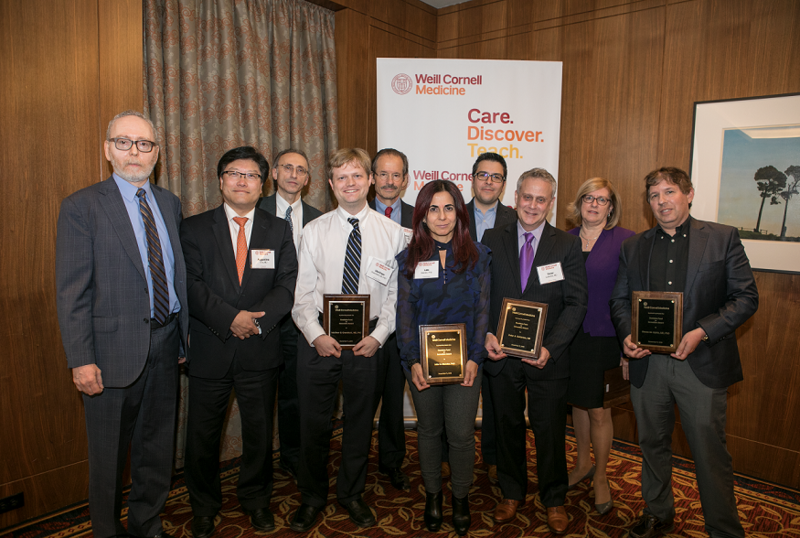 Weill Cornell Medicine honored the winners on Nov. 5 at the Daedalus Fund for Innovation Awards Reception, for which Dr. David Schenkein, CEO of the pharmaceutical company Agios and a member of its board of directors, was the keynote speaker. Therapies that harness the immune system to fight cancer have enormous potential. One powerful approach to provoking an immune response is to activate the innate immune system, which normally responds to microbes. The innate immune response is initiated when common features of bacteria are detected by sensors on the surface of dendritic immune cells, which thereby stimulate a rapid attack upon the foreign invaders. Dendritic cells also play a role in promoting a longer-term adaptive immune response, which relies on the production of antibodies. Previously, Dr. Blander has shown that when tumor cells are instructed to produce a common bacterial protein called flagellin, they can activate two different bacterial sensors – Toll-Like Receptor 5 (TLR5) and Nod-Like Receptor C4 (NLRC4) – on dendritic cells and induce a robust anti-tumor immune response in mice. With Daedalus funding, Dr. Blander will engineer a therapeutic antibody that contains all the elements needed to activate TLR5 and NLRC4 on dendritic cells and target the response to tumor cells. First, she will fuse two bacterial proteins together and link them to a tumor-associated protein called tyrosinase. The resulting novel protein product will be incorporated into an antibody that binds to dendritic cells. After internalizing the antibody, the dendritic cells will be poised to activate the immediate innate immune response, as well as the longer-term, T cell-mediated adaptive immune response. There would be no need to incorporate additional immune-stimulating factors into the cancer immunotherapy, and the strategy would serve as a powerful combination with immune checkpoint blockade therapies. Dr. Blander anticipates that this research will move her closer to commercializing the technology. Triple negative breast cancer (TNBC) and non-small cell lung cancer (NSCLC) are aggressive cancers with poor prognoses. Tumor cells from these and other cancer types undergo changes in their metabolism that enable them to survive and multiply rapidly. One such change is the requirement for larger than usual amounts of the amino acid serine. In both TNBC and NSCLC, the cancer cells must synthesize serine to survive, rather than obtaining it from external sources, as normal cells can. Thus, the enzyme that catalyzes the first step in serine synthesis, called PHGDH, is an attractive target for cancer therapeutics. Previous support from the Daedalus Fund allowed Dr. Cantley’s lab, in collaboration with the TDI (Tri-Institutional Therapeutics Discovery Institute), to identify potent drug-like inhibitors of PHGDH. They showed that one of these inhibitors can specifically inhibit serine synthesis in cancer cells grown in the laboratory and that it is toxic to breast cancer cells in which the gene encoding PHGDH is overactive. Now, with additional Daedalus funding, Dr. Edouard Mullarky, a postdoc in Dr. Cantley’s lab, seeks to extend these findings and demonstrate the inhibitors’ effectiveness in cancer cell lines and mouse models of these diseases, both alone and in combination with standard-of-care therapies. In vivo proof-of-concept studies would represent a significant preclinical milestone in the development of inhibitors of serine synthesis for treating NSCLC and TNBC patients. Drugs called checkpoint inhibitors, which prevent the immune system from shutting down in the presence of tumors, have demonstrated remarkable clinical responses against melanoma and lung cancer. But so far, they haven’t worked well in metastatic ovarian cancer and have been only partially successful in bladder cancer. These therapies may fail because additional mechanisms act to suppress the immune system. Targeting these other mechanisms may enhance the efficacy of cancer immunotherapy. Dr. Cubillos-Ruiz has discovered that a cellular response to stressful environmental conditions, known as the endoplasmic reticulum (ER) stress response, can both promote cancer cell survival and hamper the anti-tumor activity of dendritic cells, a type of immune cell. Thus, the ER stress response represents an attractive target for novel immunotherapies. With Daedalus funding, he will generate a new class of therapeutic vaccines using dendritic cells lacking ER stress sensors, which will armor them against the debilitating effects of ER stress response activation in the presence of tumors. His precision immunotherapy strategy is expected to awaken potent anti-tumor responses that should synergize with checkpoint inhibitors and, consequently, evoke durable therapeutic immunity against ovarian and bladder cancers. Successful completion of the project will establish proof-of-concept and generate a sufficiently compelling data package to generate commercial interest. Nearly 21 million people in the United States suffer from neuropathic pain, a type of chronic pain caused by damage to the nervous system. Opioids have been routinely prescribed as a therapy, but these drugs are associated with physical dependence, addiction and fatal overdose. Non-opioid drugs that relieve neuropathic pain are urgently needed. Proteins called HCN1 ion channels regulate excitability of neurons, including sensory neurons that transmit information – among them, those related to pain – from the peripheral to central nervous system. Neuropathic pain can arise from hyperexcitability of these sensory neurons, which in turn can result from increased expression and/or function of HNC1 channels. With Dr. Goldstein’s first round of Daedalus funding, he synthesized a first-generation new drug candidate called RU51nb2 that had two significant features: It specifically blocked only the HCN1 ion channel subtype, reducing the chances of side effects, particularly those affecting heart rhythms; and it was targeted to the outside of cell membranes, where it could readily access the HCN1 channels. Additional Daedalus funding will allow him to test whether RU51nb2 relieves neuropathic pain induced by chemotherapy in rats and to conduct more extensive tests on how the chemical works at the cellular level. There are extensive intellectual property opportunities for both the specific target and the cellular targeting approach. Successful completion of these proof-of-concept studies would strongly promote an alliance with biopharma or the formation of a new start-up company to translate this work to the clinic. Several types of cancer cause the breakdown of bone, which is extremely painful and debilitating. There are few therapies that prevent bone loss in cancer, and their use is limited by concerns about their potential to cause cancer. New therapies that build bone without causing uncontrolled cell proliferation are greatly needed in the clinic. In preclinical work, Dr. Greenblatt discovered that blocking a molecule called Schnurri 3 (SHN3) in osteoblasts – the cells that build new bone – resulted in the greatest increase in bone formation ever reported. It also prevented pathologic bone destruction mediated by tumor cells without affecting normal bone turnover or causing such unwanted effects as uncontrolled cell proliferation. With Daedalus funding, Dr. Greenblatt will test the effects of SHN3 inhibitors in combination with bisphosphonates, the standard-of-care drugs used in some patients, to see if they improve outcomes in a mouse model of breast cancer-mediated bone destruction. He will also determine the biophysical properties of the candidate inhibitors and investigate how they are metabolized. Finally, he will develop and implement complementary screening processes to identify additional candidate compounds. Together, these activities will de-risk the drug development process and attract outside investment. Severe, prolonged seizures can cause lasting brain injury, including neuronal death. The cells die through an active process called programmed cell death, or apoptosis, which is induced by molecules secreted in the damaged region. Dr. Hempstead discovered that although a protein called nerve growth factor (NGF) promotes the survival of specific neuronal cell types during development, its precursor, ProNGF, causes nerve cells to die following several forms of neuronal injury, including stroke or seizures. Thus, she hypothesized that ProNGF could serve as a target for therapeutics aimed at limiting brain injury after seizures. Dr. Hempstead has shown that infusion of a pool of antibodies specific for Pro-NGF is highly effective in preventing the neuronal cell death that occurs in the rat brain following seizures. In collaboration with an industry partner, she has screened more than 500,000 antibodies and found several that are highly specific for the target and block its activity in cultured neurons. With Daedalus funding, she will identify the optimal antibody among several with in vitro efficacy, so that they would be feasible as a therapy. She will validate the target by testing the antibodies’ nerve-sparing abilities in rats following seizure. This data will de-risk and leverage the technology, thereby creating a strong business case for an alliance with biopharma and investment in the target. Colorectal cancer (CRC) is the second leading cause of cancer death in the United States. Several research teams have shown that the presence of the bacterium Fusobacteria nucleatum increases the risk of developing CRC. It also increases the risk of CRC metastasis and chemotherapy resistance, and reduces the overall survival rate of CRC patients. While vaccines are a well-established approach to reducing bacterial infection, there are currently no vaccines against F. nucleatum. Dr. Lipkin has identified molecules from F. nucleatum that stimulate an immune response to the bacterium in mice and can be part of the first vaccine against F. nucleatum. Most vaccines also include adjuvants, vaccine components that augment host immune responses to the specific bacterial molecules. With Daedalus funding, he is delineating the most immunogenic combination of adjuvant and F. nucleatum molecules that is most effective at provoking an immune response to this microbe. In addition, he aims to demonstrate that vaccination effectively reduces F. nucleatum colonization of the mouse colon and reduces the colorectal tumor burden. Dr. Lipkin’s long-term goals are to test whether an F. nucleatum vaccine will prevent CRC in Lynch syndrome patients, who have a genetic predisposition to the disease, and then expand the vaccine use to newly diagnosed CRC patients. Overall, this project will help complete the necessary pre-clinical data package to make the first F. nucleatum vaccine attractive for licensing and additional investment. For many blood diseases, the main curative treatment is transplant of bone marrow donors’ hematopoietic stem cells, which can generate all the different blood-cell types. However, many patients do not find compatible donors. Dr. Rafii and Dr. Raphael Lis, along with collaborators, have devised a method to convert adult human endothelial cells, which line blood vessels and are readily available in patients, into hematopoietic stem and progenitor cells (HSPCs). They achieve this by isolating endothelial cells and instructing them to overproduce certain proteins associated with blood stem-cell function. These reprogrammed blood cells are grown and multiplied alongside vascular cells that support their development and self-renewal. These HSPCs, once transplanted, are then able to take up residence in the bone marrow, reconstitute the body’s blood cells and renew themselves, like native stem cells. With Daedalus funding, Dr. Rafii and his team will test methods with the endothelial cells to deliver the genes to enhance conversion of these endothelial cells into blood cells. This will improve the safety and efficacy profile of the process. They will also assess whether altering cellular signaling through factors that stimulate cell growth and proliferation can accelerate and scale up the generation of HSPCs. Together, these studies will provide a major necessary regulatory step toward producing abundant human HSPCs from endothelial cells for transplantation into patients who need a new source of healthy blood cells. “Many patients with hematological malignancies or other serious blood disorders are unable to have lifesaving bone-marrow transplants, due to lack of compatible donor blood. With the support of the Daedalus Fund, Dr. Raphael Lis and I – along with collaborators – have devised a method to convert normal endothelial cells, which line blood vessels, into authentic, repopulating hematopoietic stem and progenitor cells. Using this approach, patients with leukemia, for example, would receive high-dose chemotherapy to kill the cancer cells, followed by a transplant of their own endothelial-cell converted hematopoietic stem cells. This would represent a major breakthrough in regenerative medicine. “Because our research is high-risk, high-reward, it is not fundable through traditional sources and agencies like the National Institutes of Health. We are fortunate that the Daedalus Fund was established to bridge the development gap, and very grateful for the support of the Selma and Lawrence Ruben Science to Industry Bridge Fund. Now, we have the necessary funding and resources to advance to the pre-clinical stage, where we can further test our hypothesis.